Upgrading from Windows 7 to Windows 8.1 is going to be the easiest overall OS upgrade to perform between Windows versions currently on the market. Windows Vista and Windows XP pale in comparison to how easy it is to go from 7 to 8.1. While it may be easy, it’s not easy to get started in some cases. 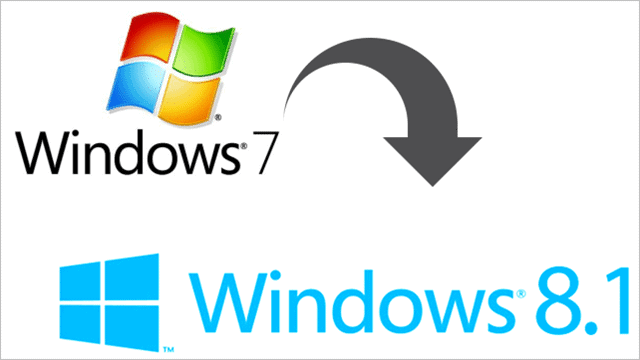 Let’s look at the process and give you some tips to make the process painless from Windows 7 to Windows 8.1. If you upgrade from Windows 7 to Windows 8.1 directly, you’ll need to re-install all apps and programs, just like Windows 8.1 Pro Preview users found out. If you upgrade from Windows 7 to Windows 8 for a cost, then upgrade for free to Windows 8.1, you’ll get to keep everything. While it’s an extra step, it’s easy to do for most users. This is the same issue Windows 8.1 Pro Preview users ran into, although they were told ahead of time by Microsoft. Unless you read a guide like ours or Microsoft’s website first, before you buy, you wouldn’t know that until you’re in the middle of the upgrade process. Unfortunately, Microsoft doesn’t seem to warn users about this when the try and buy Windows 8.1 online or when you purchase the DVD to install manually. If you decide to upgrade electronically anyway, you’ll only be able to bring your folders and files with you; everything else will have to be uninstalled, and you won’t know realize that until you are in the middle of installation which means you’ve spent money for Windows 8.1 and have no recourse. Now, the real question is: Can you still purchase Windows 8? Retailers online and retail locations worldwide will still carry Windows 8 until Microsoft has run out of boxed copies in its warehouses. You will need to buy a DVD copy, whether online or at a store, and install it the good old-fashioned way. This may take more time, mostly waiting for the DVD to arrive or pick it up yourself, but it’s the best way to upgrade from Windows 7 to Windows 8.1. We don’t recommend buying Windows 8 on eBay or any other auction sites or from a private person. Rather, stick with legitimate and well-known companies, such as Amazon.com, Best Buy and other retails. By buying Windows 8 first, then upgrading to Windows 8.1 later, you can save yourself the majority of headaches you’d run into during the Windows 7 to Windows 8.1 upgrade process. If you can’t find a copy of Windows 8, it may not be the end of the world. A fresh install may be the best way to rejuvenate and refresh your PC, especially if it’s been less than efficient than you want it to be. A clean install can work wonders and magic for a PC, and many computer experts – ourselves included – recommend doing it twice a year to keep your computer running at its best. This may be the perfect time to do just that for your PC during the Windows 7 to Windows 8.1 upgrade process. Remember: Before you update to Windows 8, then Windows 8.1, make sure you backup your files and folders anyway. Create a system restore media for Windows 7, and then Windows 8 once you install it. Then, proceed to upgrade to Windows 8.1. While this may seem cumbersome and unnecessary, if anything goes wrong during the upgrade process, you won’t have to worry about losing your personal information. Why Microsoft continues to make the overall upgrade and installation process for Windows 8 and Windows 8.1 users harder than it has to be we’ll never know. However, using the tips above and upgrading to Windows 8 first as a Windows 7 user will save you some headaches along the way. Windows 7 to Windows 8.1 doesn’t have to be difficult or frustrating for users, if they know what they’re getting into before they upgrade, they’ll be ready to go and take advantage of everything Windows 8.1 has to offer them. Share your Windows 7 to Windows 8.1 upgrade experiences with us below! How seamless was it for you? Let us know below! If you ran into any issues and need help troubleshooting, TechNorms is here for you!